Overview: Tuberculosis (TB) kills more people today than HIV and malaria combined. In 2016, there were an estimated 10.4 million new TB cases worldwide and 1.7 million TB deaths, according to the World Health Organization. And India is at the epicentre of this global epidemic, with half a million TB deaths annually. India also accounts for 16 per cent of the estimated 490,000 new cases of multi-drug resistant TB. Can India turn things around and control this epidemic? Overview: Nutritional care is considered fundamental to clinical practice and recognised to be an integral part of TB care, by the WHO and the Revised National Tuberculosis Control Programme(RNTCP). Undernutrition is a comorbidity which is widely prevalent, severe, and persistent even after cure in Indian patients, in the absence of nutritional support. This increases their risk of mortality, drug-induced hepatotoxicity, malabsorption of key drugs like rifampicin, performance status, and relapse even after successful treatment. Providers need to assess weight, height, edema, estimate BMI & measure haemoglobin. BMI < 14 kg/m2, edema, severe anaemia, inability to stand, are red-flag features which mandate referral for initial inpatient care. Patients should be counselled on an appropriate balanced diet with 3 meals and at least 2 snacks. The RNTCP has evolved food assistance packages consisting of cereals, groundnuts or pulses, milk powder or oil for provision of around 1000 calories and up to 50 gram proteins to patients during treatment, suggests provision of 1 recommended daily allowance of micronutrients and an enhanced quantum of food rations through the public distribution system to TB affected households. Which of the following is true of undernutrition and TB? The correct answer is (c). BMI is calculated as weight in kg/(height in metre). The BMI in this patient would be 45/(1.7)2= 15. 57 kg/m2. This is less than 16.0 kg/m2 and indicates severe undernutrition. Which of the following drug/s should be given on an empty stomach for better bioavailability? The correct answer is (d). The bioavailability and peak serum concentrations of both isoniazid and rifampicin is affected by food. A labourer with TB has signs of hypoproteinaemia. What would be an appropriate dietary advice? The correct answer is (c): The commercial protein supplement may contain 40 gm protein in a 200-gm pack, but is costly and inappropriate, as are tonics with amino acids. Mutton and chicken are more expensive than eggs and the labourer is more likely to afford additional pulses or eggs, than eat chicken or mutton on a daily basis. The protein content per 100 gm, does not differ between eggs and chicken. Pyridoxine deficiency can occur due to treatment of which anti-TB drug? The correct answer is (b). Isoniazid interferes competitively with pyridoxine metabolism by inhibiting the formation of the active form of the vitamin, and hence often results in peripher¬al neuropathy. This is especially marked in malnutrition, pregnancy, lactation, HIV infection, diabetes and hypertension. This effect can be prevented by giving pyridoxine 10 mg per day. The correct answer is (a). In a patient with very low BMI and who has probably been eating little for many days, vigorous feeding may result in refeeding syndrome which can be danger¬ous. The feeding should start at 50% of the dietary requirement or even lower in the first few days, along with the other measures mentioned. Overview: Today, about 10% to 50% of all TB patients in India fail to complete treatment, depending on the type of TB the patient has. The consequences of poor adherence to TB treatment are disastrous, increasing the risk of patient morbidity and mortality, disease relapse, drug-resistance, and transmission of TB. While the Revised National TB Control Programme (RNTCP) has long relied upon direct observation of therapy (DOT) for TB patients, this monitoring strategy requires greater resources than are available to most GPs. New technologies for monitoring medication adherence—including cellphone-based strategies and electronic pillboxes—may soon become available to GPs in parts of India and provide alternative strategies for monitoring pill-taking by patients in real time. Once a GP identifies medication non-adherence, she or he should screen for and address toxicities from TB medications, poor nutrition and other comorbidities (e.g., HIV, diabetes), psychosocial barriers (e.g., depression, stigma, substance use disorders) and poor treatment literacy that could be contributing to non-adherence. Improving TB medication adherence therefore requires an interdisciplinary approach. Mohan is a 53 year old man who visits your office with a month of productive cough, 8 kilograms of weight loss, and night sweats. He has type II diabetes, for which he takes glyburide 5mg twice a day. He has a pleasant demeanor and you learn he is an avid cricket fan. In your initial investigation, you find that a chest X-ray shows a right upper lobe infiltrate, and sputum microscopy shows 2+ acid fast bacilli. He denies ever having had TB previously. You diagnose Mohan with pulmonary tuberculosis (TB) and decide to initiate him on once-daily treatment with isoniazid, rifampicin, pyrazinamide, and ethambutol (AKT-4). He weighs 53 kilograms at the time of your initial evaluation. As you start Mohan on TB therapy, what counseling should you provide to counter potential medication adverse effects and to minimize drug-drug interactions, so that he is more likely to adhere and complete therapy? The correct answer is (F). Rifampicin often turns body fluids a red-orange color. Alerting patients ahead of time to this benign side effect may help minimize unnecessary concern or interruptions in therapy. Pyridoxine should be considered for all patients starting TB therapy including isoniazid, but Mohan is at particularly high risk for isoniazid-related peripheral neuropathy due to his diabetes, which can also cause peripheral neuropathy. People living with HIV, malnourished patients, and patients on other medications that can cause peripheral neuropathy (e.g., multidrug resistant TB patients on ethionamide, cycloserine, or linezolid) are also at higher risk for isoniazid-related peripheral neuropathy. Rifampicin can decrease blood levels of sulfonylureas used to treat diabetes, including glyburide, which can result in worsened blood sugar control in some patients.1,2 As such, patients on sulfonylurea medications should have their diabetes monitored closely, as they may require modifications of their medications while on TB therapy. There is no specific requirement that patients should take their TB medications only at bedtime. In general, for patients on standard therapy for drug-susceptible TB, it is important that patients take their medications at the same time every day (whether in the morning or at night). TB medications are best absorbed if taken on an empty stomach; however, for patients with significant gastrointestinal side effects, taking medications with food may be considered to reduce these side effects. You see Mohan again more than 6 weeks after starting TB therapy. His weight has dropped from 53kg to 48kg, and he has evidence of temporal wasting. When you talk to him, he endorses ongoing fatigue and night sweats. You worry that he does not seem to be improving clinically after starting TB therapy. What should you do? The correct answer is (F). Ongoing weight loss after weeks of TB therapy should raise concern for potential drug-resistance, poor medication adherence, and poor quality of the patient’s diet. Per the Standards for TB Care in India, drug susceptibility testing (DST) should be offered to all diagnosed TB patients prior to starting therapy. however, in cases where DST was not done at the initiation of therapy, failure to respond to therapy as evidenced by ongoing weight loss should prompt GPs to send a DST. Ongoing weight loss may also suggest that a patient is not taking his or her medications, so screening for non-adherence using simple questions (such as the Morisky questions) is important. Low caloric intake and poor protein intake may blunt replenishment of the patient’s nutritional stores, especially in patients with food insecurity, vegetarian patients with poor protein intake, and patients with a high catabolic state from other comorbidities (e.g., HIV cachexia). Streptomycin alone should not be added empirically to the patient’s medication regimen. If there is high concern for drug-resistant TB, DST should be performed, and empiric multidrug- resistant TB therapy (which would involve addition of multiple medications) can be considered in some cases pending the DST result. While a prednisone taper might briefly increase the patient’s weight and temporarily improve symptoms, it would not improve the patient’s long-term response to TB therapy. You look in his chart and see that a GeneXpert test sent at the start of therapy was negative for rifampicin resistance. You ask the patient about his medication adherence, and he admits to only taking his TB medications twice in the last week. Upon more careful questioning using the Morisky questions, the patient notes that he experienced some clinical improvement after taking his medications regularly for the first 2 weeks, but then he stopped taking his medications as frequently because he was starting to feel better. He also notes that he often forgets to take his medications due to his busy work schedule and confusion with his diabetes medications. What messages can you share with Mohan to ensure that he takes his TB medications every day? The correct answer is (H). Unfortunately, evidence-based data about the best approaches for ensuring adherence to TB medications are lacking. However, some common-sense strategies for improving medication adherence include improving the patient’s treatment literacy (by educating about the consequences of non-adherence), setting daily reminders to facilitate pill-taking, involving close family members in the patient’s TB care, and implementing a “talk back” strategy at each visit, in which the patient repeats back your recommendations to confirm his or her understanding. Patients should not stop TB medications for acid reflux or mild nausea, though they should get in touch with their GP. GPs can then check LFTs to rule out hepatotoxicity and recommend therapies to reduce these GI side effects, such as antacids. Maintaining good glycemic control is important during TB therapy, and patients should not be advised to stop their diabetes medications while on TB therapy. On follow-up visits for the next two months, Mohan reports improved medication adherence, and his weight increased and symptoms improved. However, he misses his fifth month visit. You call him and Mohan comes into your clinic one week later with his wife. He looks disheveled, does not make eye contact, and provides terse answers during your interview. He smells of alcohol. His wife notes that he becomes intermittently tearful at home and stopped going to work three weeks ago. He stopped taking his TB medications completely at that time. What should you do? The correct answer is (E). Depression and alcohol use disorder are two common barriers to TB medication adherence. Simple questionnaires—such as the Patient Health Questionnaire- 2 (for depression) and the AUDIT-C (for alcohol use disorder)—can be easily implemented during brief patient visits to screen for these problems. Ideally, patients should be referred to mental health specialists to help with these problems; however, finding a qualified specialist can be difficult in many areas of India. Encouraging compassionate, non-judgmental involvement from a patient’s family members can sometimes provide the social support needed to get through TB therapy. The patient should not be advised to stop TB therapy, because premature termination of therapy will increase the risk for relapse of TB. Before the visit is finished, the patient’s wife notes that the patient has started drinking alcohol heavily again (around 7 or 8 drinks a day) after years of sobriety and asks for you to provide advice about the patient’s alcohol use disorder. What should you advise? The correct answer is (E). Patients with alcohol use disorder should be reminded about the increased risk of hepatotoxicity from TB medications. Identifying triggers that lead the patient to use alcohol heavily may help patients to reflect upon how they can avoid these triggers and cut down on drinking. For heavy drinkers, eating before drinking may improve nutritional status and blunt the effects of alcohol. It is important to have a non-judgmental approach to patients with substance use disorders. Patients are more likely to have ongoing engagement with healthcare providers who are open and compassionate. Recent studies suggest that supportive engagement of patients with alcohol use disorder can improve their TB treatment outcomes. Overview: Multidrug-resistant (MDRTB) and extensively drugresistant TB (XDR-TB) are demanding conditions to treat and are best managed by a specialist with experience in treating such severe forms of TB. Even in the best hospitals, under optimal conditions, global treatment success rates are in the vicinity of 60% for MDR-TB and 44% for XDR-TB. Errors in treatment amplify resistance and convert MDR strains to XDR-TB and beyond. The 10 principles outlined here maximise the chances of successful outcome. Overview: The success of tuberculosis treatment rests on multidrug antituberculosis therapy at least for six months. During the prolonged course of therapy, patients and providers may confront many adverse drug events (ADE). While minor ADE are common, some are rare and potentially life threatening. Hence it becomes obligatory for the providers to anticipate ADE during therapy, and take necessary measures when ADE occur. The common adverse events are mild elevation of liver enzymes, skin rash, gastrointestinal intolerance, neuropathy and arthralgia and can be managed symptomatically without discontinuation of the offending drugs. Serious adverse events are severe hepatitis, Steven Johnson syndrome, immune thrombocytopenia, agranulocytosis, hemolysis, renal failure, optic neuritis and ototoxicity. These warrant immediate stoppage of drugs and in some cases contraindicate re-challenge. Single most important factor to prevent adverse patient outcomes in terms of severe/chronic disease or fatality is prompt recognition of ADE, discontinuation of the probable drug/s with appropriate evaluation and management. Patients must be educated about symptoms of adverse events and asked to report them promptly. Prevention of monotherapy during the management of ADE is critical to prevent emergence of drug resistant TB. Which of the following drugs has the highest potential to produce exfoliative dermatitis? The correct answer is (c). The propensity of the drugs to cause erythroderma (exfoliative dermatitis) are PZA >SM >EMB >RIF >INH with rates for PZA being 2.4 %. All the drugs have to be stopped and reintroduction of the ATT is to be done with INH followed by RIF, EMB and PZA with careful monitoring. To prevent monotherapy, 2 new drugs which were not used previously should be added while introducing individual drugs. Which of the following adverse events is a contraindication to rechallenge of the possibly implicated drug during treatment with ATT? The correct answer is (c). Drug induced thrombocytopenia is because of immune mediated mechanisms because of production of autoantibodies or drug dependent antibodies resulting in rapid destruction of platelets. It is a life threatening complication and is an absolute contraindication to rechallenge as even minute quantities of the drug can trigger immune mediated destruction of platelets leading to severe hemorrhage. Which of the following ATT drugs has no hepatotoxicity potential? The correct answer is (d). The propensity to produce hepatotoxicity is with PZA> INH> RIF. Ethambutol, streptomycin and moxifloxacin do not have hepatotoxic potential and they can be administered safely in patients with hepatotoxicity while discontinuing those drugs with hepatotoxic potential and to accompany the individual drugs on rechallenge to prevent monotherapy . Which of the following is a risk factor for ATT induced hepatitis? The correct answer is (d). Advancing age, female gender, chronic alcohol consumption, pre existing liver diseases, hepatitis B, C and HIV coinfection, malnutrition are some of the important risk factors for drug induced hepatotoxicity. They have to be carefully sought prior to the initiation of ATT and their presence warrant close monitoring of liver function tests every 2-4 weeks on therapy. Which of the following is false regarding adverse reactions to TB drugs? a) Jaundice is a common adverse effect and is always due to liver adaptation which is self-limiting. The correct answer is (a). Jaundice is a sign of hepatitis and warrants stoppage of all TB medications, and investigations for druginduced hepatitis. However, it can also occur rarely due to drug induced hemolysis which is a life threatening complication. Liver function tests and complete blood counts are to be requested to differentiate drug induced hepatitis and hemolytic jaundice. Drug induced hepatitis is diagnosed when serum aminotransferase level >5 times the upper limit of normal [ULN] without symptoms or >3 times the ULN with symptoms. 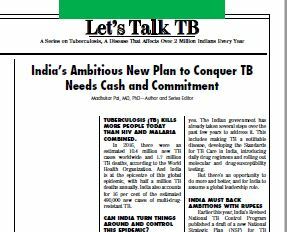 Overview: The Call to Action for a TB-Free India echoes WHO’s ‘End TB Strategy’ and calls for the country to intensify TB care and prevention efforts to end TB in India. The vision of the End TB Strategy is A World free of TB: Zero TB deaths, Zero TB disease, and Zero TB suffering. Overview: Persons affected by tuberculosis and their family members should be counselled at every opportunity, to address information gaps and to enable informed decision-making. Counselling should also address issues such as healthcare, physical, financial, psycho-social and nutritional needs. The objective of counselling is to meet the needs and ensure the rights of the patient. The objective is also to support the patient where possible to overcome barriers to successful treatment. During counselling, patients need to be informed about TB, how the disease spreads, signs and symptoms, consequences of not following treatment guidelines, why treatment is long and why completion of treatment is critical, likely adverse events during therapy, and cost involved in treatment and what free/public services are available to patients. Patients need to be told that TB is a fully curable and treatable disease. We must use patient centred approaches, and recognize that all TB patients deserve a minimum package of holistic TB care services that are not restricted to diagnosis and pharmacological treatment, but include counselling and support services as well. Overview: Indian TB patients get diagnosed after a delay of nearly two months, and are seen by 3 different providers before a diagnosis is made. At the primary care level, patients rarely get investigated for TB, even when they present with classic TB symptoms. Instead, providers give broad-spectrum antibiotics (e.g., fluoroquinolones) and remedies such as cough syrups and steroids. Even when TB is considered likely, private physicians tend to order tests that are non-specific, such as complete blood count, ESR, Mantoux test, and chest X-rays. They rarely seek microbiological confirmation via sputum smear microscopy, culture or polymerase chain reaction tests. Even if the diagnostic hurdle is overcome, TB treatment in the private sector is far from standard. When private practitioners initiate anti-TB treatment, they tend to use drug regimens that are not recommended by WHO or the International Standards of TB Care. Furthermore, private practitioners often fail to ensure treatment completion, and provide adherence support to their patients. This article discusses the 10 most common pitfalls that doctors should avoid. Addressing these pitfalls should great improve the quality of TB care in India. Overview: GPs frequently see children in their clinical practice, and should be alert to the possibility of pediatric TB, especially in malnourished children. Children with TB often present with vague, non-specific symptoms, and this makes it hard to suspect and diagnose TB. Symptoms could include chronic fever, cough, weight loss, fatigue, loss of appetite, failure to gain weight, and lymph node enlargement. History of contact with an adult with TB is therefore a very important component of history that should be elicited. There is no adequate gold standard test for childhood TB, and diagnosis requires multiple tests. Smears for acid-fast bacilli (AFB) are often negative because of the low numbers of AFB in childhood TB. Therefore, liquid culture and molecular tests (Xpert MTB/RIF) will be most helpful, along with signs, symptoms, chest radiology, evidence of TB infection (e.g. positive Mantoux skin test), and history of contact with active TB. All children who have not been treated previously and do not have other risk factors for drug resistance should receive a WHO-approved first-line treatment regimen for a total of 6 months. The initial phase should consist of two months of isoniazid, rifampicin, pyrazinamide and ethambutol. The continuation phase should consist of isoniazid and rifampicin given for 4 months. Daily treatment is preferable to intermittent therapy. Drug dosages are calculated according to weight (not age). Adherence to the full course of anti-TB therapy is very important to ensure high cure rates. In general, children tolerate first-line anti-TB therapy very well with low risk of toxicity. Overview: Drug-resistant TB (DR-TB) is a serious and growing threat in India, especially in urban areas such as Mumbai. Multidrug-resistant TB (MDR-TB) is resistance to two of the most important first-line anti-TB drugs – isoniazid and rifampicin. Some patients develop more severe forms of DR-TB. Extensively drug-resistant TB (XDR-TB) is resistance to isoniazid and rifampicin, plus any fluoroquinolone, and at least one of 3 injectable second-line drugs (i.e., amikacin, kanamycin, or capreomycin). DR-TB occurs when patients fail to complete first-line drug therapy, have relapse, or newly acquire it from another person with DR-TB. If patients have any risk factors for drug-resistance, or live in a high MDR-TB prevalence area (e.g., Mumbai city), or do not respond to standard drug therapy, they must be investigated for MDR-TB using drug-susceptibility tests (DST) like GeneXpert, line probe assays, and liquid cultures. MDR-TB requires long-term and specialized treatment. So, patients should be referred to specialists, either in the private sector, or in the public sector where free MDR treatment is available. This Q&A covers commonly asked questions by the primary care doctor about identification and referral of patients with suspected or confirmed DR-TB.